We have all been watching the battle between the IRS and Tea Party groups. There is growing, and maybe clear evidence that the IRS has been holding up certain groups for political reasons. There is also evidence that some staffers campaigned for candidate Obama while at work. 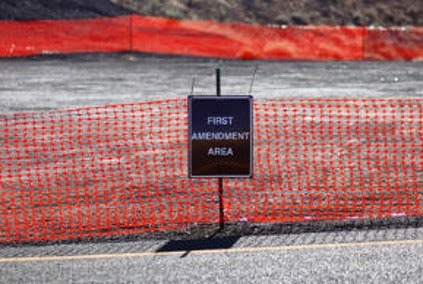 But there is much more at stake with this – and that is the 1st Amendment. By giving one political group more power than another they can effectively control speech – and possibly elections. I have been watching the battle between LGTB and Conservative groups over gay marriage. For the most part the battle is only over marriage. So far the process is working, if not at a snails pace. But this piece isn't about gay marriage, but the right to voice your opinion is being placed in danger. A recent headline grabbed my attention, Hate group leader Peter LaBarbera detained at Canadian airport. Until that moment I have never heard of the anti-gay group, Americans for Truth about Homosexuality. After looking over the website I agree with LGBT groups that this is in part a hate group – not so much because of their stand on marriage, but for a stand against homosexuality in general. With that said, I will defend their right to exist as long as they don't physically harm people. Simply because a group or person might spout hate, that doesn't mean people should listen and act on that speech. Those who act on that speech already had those beliefs. It scares me that in Canada a person can be arrested for simply speaking out about their beliefs. If they wish to deny entry to people, that's up to the Canadian people. There are those in this country who would love for government to allow only their speech – those people come from both the left and right political spectrums. I am sure many on the left cheered what happened to Mark, but you must remember you might someday find yourself on the short end of the straw. One thing is for sure, power always shifts. When Jewish Germans registered their guns under the Wiemar Republic rule, they never imagined the evil leader that would soon replace that government. I noticed the AFTAH also was a 501(c)3 group. This means that they have declared themselves a non-profit and pay no taxes. There are groups on both the left and right that I wouldn't want to support with my tax dollars. We are now giving the Executive Branch of government the power to pick and choose who has the right to form political and social groups with non-profit rights. This is a lot of power for government to hold and you can be sure that all political ideologies will use it to their benefit, especially those with the most power. We have people losing jobs because of their political beliefs. The latest fight is to have Condoleezza Rice removed from the board of Dropbox(online storage company) for her political past. We, as Americans, can run around punishing people for positions with which we don't agree, but where will this place us in the future? Your side might win today's war for protected speech and political groups, but the tide always changes. Tomorrow you will likely be on the bottom and your speech and group will not be allowed. Unless you fight today for the right of all people to speak freely, you will someday lose. As long as we allow government to have control over who can form tax exempt groups, we will all find ourselves on the bottom at some point. We will always have social disputes, and as long as we attempt to use government to further our side, it will also at some point in the future work against us. The best solution to marriage is for government to stop interfering and let people and communities decide for themselves. All laws must apply to all citizens equally. The moment we begin creating sub-classes, you might someday find yourself in one of those groups. Today you can easily travel around the globe. At any given time you can find yourself in a foreign prison for simple things such as being a Christian, LGBT, wearing the wrong clothes, or simply for being an American. US citizens are often told to lie in certain countries and say they are Canadian so that they don't face violence or discrimination. We can't change the rest of the world, but we can repair the country in which we live. Unless you fight for the right of all speech and beliefs, as long as it doesn't do direct harm to people, then our future is dark. Today in America we have different groups trying to suppress others. I see none of them as being completely right. All sides are making the same mistake, using government to suppress individual liberties and speech. Turn on the television and you will see a lot of people acting like 2nd graders. One day maybe all the different sides will be able to sit down and talk like adults. Hate is wrong, no matter if it's against LGBT, Conservatives, or Democrats. Grow up America, it's time to sit at the grownup's table. No matter if you take part in the fabled war on women or some other crafted cause, the endgame is to shift political power. The only shift in power we need is one back to the people and away from crony politicians.